High-lying pastures normally were leased-out to bigger groups of settlers rather than individuals. The land was divided up between the families who built their homes and barns in the middle of the assigned land for economic reasons. As the little income from the meagre mountain pastures commanded large areas, the homes often were far away from each other. This is economically and historically the cause for the characteristic Walser settlements with scattered buildings. They can be found throughout the whole Großwalsertal, from Thüringerberg to Buchboden. Residential and farming building are separated. The often far away pastures for hay made it necessary to build haylofts, often in conection with barns, that would save the farmers such a long way to store their hay. 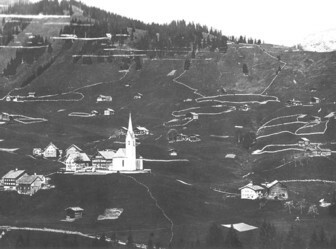 Also in Kleinwaslertal, especially in Hirschegg, the typical characteristics of such scattered settlements are noticeable. 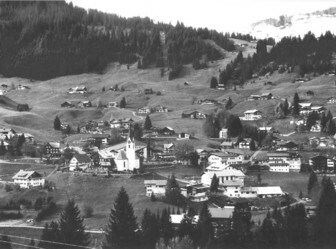 The church, school building, manse and the only tavern in the locality represent the centre of this Walser village. The increasing trend to build around the centre is especially recognisable in tourist resorts. The change in economic situation also brings change in the townscape. At first, areas in the valley without forest were populated. Once they were cramped, the Walser started to systematically clear the forest which was rather seen as an enemy than a commodity. So it reduced to narrow stripe of forest. In some places the clearing went so far that the settlement was no longer protected against avalanches and mud flows. They were destroyed and had to be given up. 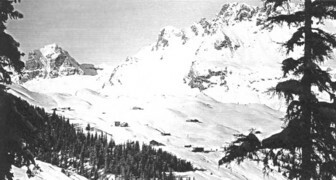 The consequences of the 1689 and 1954 avalanche catastrophes were unpredictable back then. The common terrain names like Rüti, Schwende or Gschwend remind of the Walser’s clearing activities. 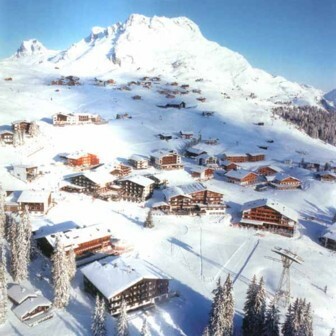 The modest Oberlech turned into a centre rich in offers for guest from all over the world.